Timo Mayer and his Mayer Vineyard are well known among the wine fraternity in Australia, Germany and the UK. Timo is wine maker at Gembrook Hills and he has his own vineyard in the Yarra Valley. The Mayer Vineyard is what is called a boutique vineyard. Timo is also member of The South Pack, a group of innovative and independent winemakers in Victoria. We know each other since many years. In fact Timo made the second vintage of our Two Hills Sauvignon Blanc (2002), which won a bronze medal at the Singapore Wine Show. 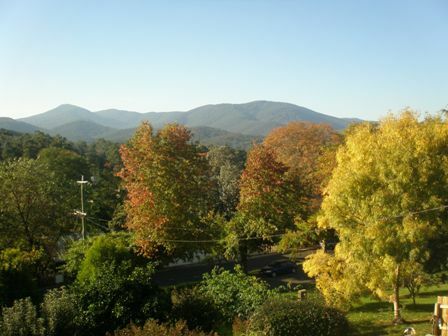 Since many years our two families have been together, usually for skiing on Mount Buller, eating and drinking, either at our vineyard in Glenburn or at Timo and Ronda’s place, the Mayer Vineyard. Also this time Timo and Ronda invited us for a gourmet dinner after an afternoon of ice skating and a visit of the Victoria market in Melbourne. The latter program was only attended by our two daughters; the old folks were only in for the eating and drinking part. 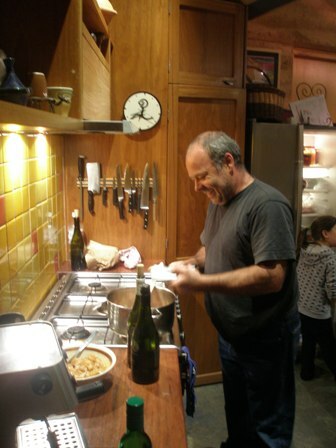 Needless to say, Timo is not just an excellent wine maker but also an excellent cook. My pictures of the event were somehow heavily affected by the enthusiasm of our re-union, and maybe, maybe, the alcohol of the many wines we tasted. Anyway, I do not have excellent pictures to show you. The longer the evening went on, the more terrible my pictures became. Bear with me. It was a great evening. But let us start with the food. 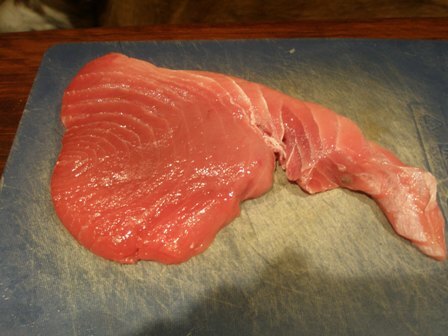 Out of this fine piece of tuna below, Timo made a delicious sashimi (second picture below). 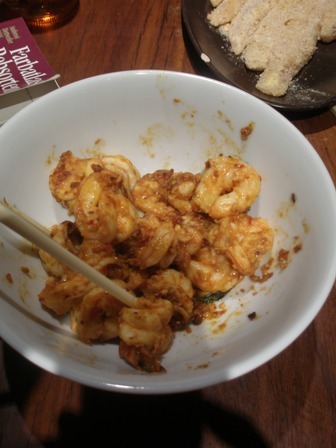 After that we ha another entrée, garlic prawns. 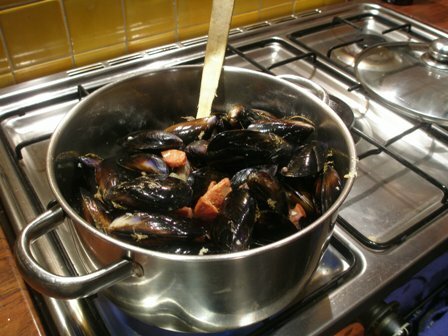 The fist main dish was mussels with chorizo sausage chunks followed by some fish (white-head for the kids, and tuna). 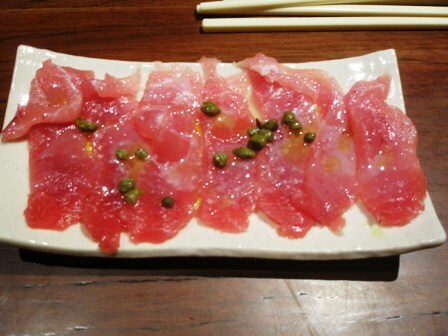 We were not in the position to eat another main course, although there was beef and various other meats waiting for us. What a wonderful feast that was. Delicious stuff. I did not take tasting notes, this was a social event and not a formal wine tasting. Below you will find photos of some the bottles. 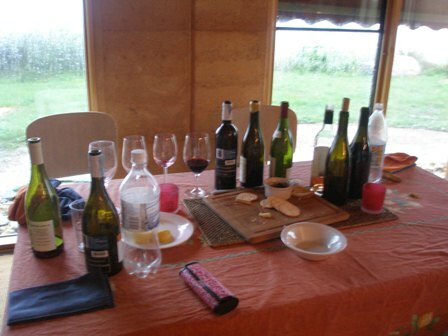 The two bottles from Domaine de Rapatel are not represented. You can find reviews in my earlier blog entries. 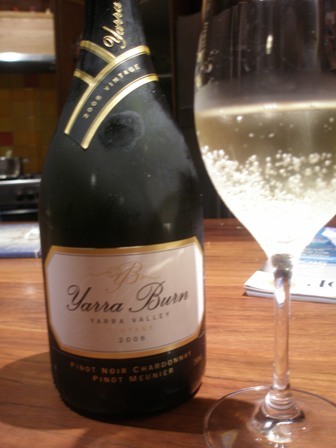 This Yarra Burn is a wonderful cool climate sparkling wine, a classical blend of Pinot Noir (58%), Chardonnay (35%) and Pinot Meunier (7%), from the Yarra Valley. The price is about A$ 22/bottle, great price-value relationship. 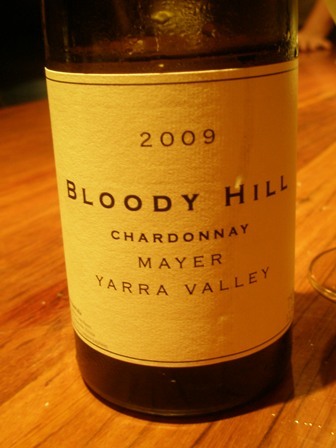 Just released, this young white wine from the Mayer Vineyard, although low in alcohol, is an easy drinking but very fine and delicate specimen of a modern Yarra Valley Chardonnay. It has funk, is zesty and very harmonious. Great wine for hot days and not so hot days. 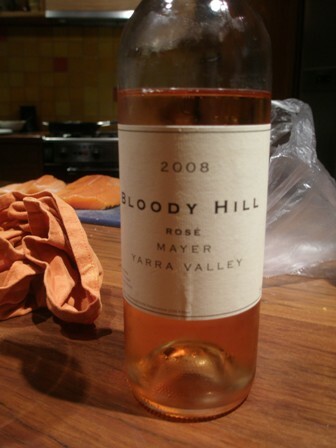 We compared the Bloody Hill Rose with the Grand Signature de Rapatel and found to our amazement that both wines, despite being of such different origins, go well with the garlic prawns. Ha, this fine wine from Beaujolais by Marcel Lapierre of Domaine du Vissoux, is just a very seductive drink. 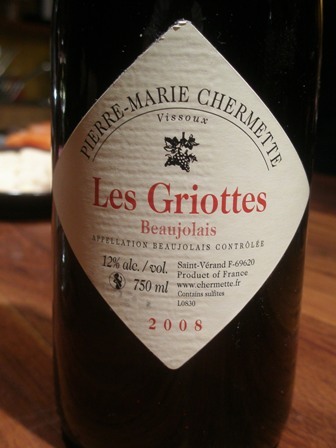 Made of Gamay grapes it represents the traditional style of a truly grand Beaujolais. It is not as fruity (among them strawberry) as the “nouveau” wines but has the structure and depth we treasure so much. The carbonic maceration gives it some banana flavours. 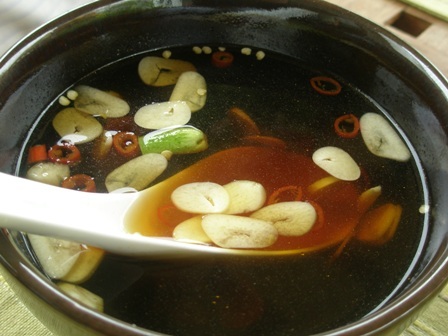 It is low in alcohol but rich in flavour. Get a bottle of it, if you can. The wine is young and you can enjoy it for some time to come. This wine is very powerful and just amazing. Thierry Allemand, the son of a factory worker and not blessed with a family history of wine making, is producing two blends, Les Chaillots and Reynard both from Cornas. The wines are made from low yielding, old vines. Thierry is one of the “wine gods”, the masters and spin doctors, producing “cult” wines. It has the “burned rubber” taste which needs some time to get used to in the beginning. 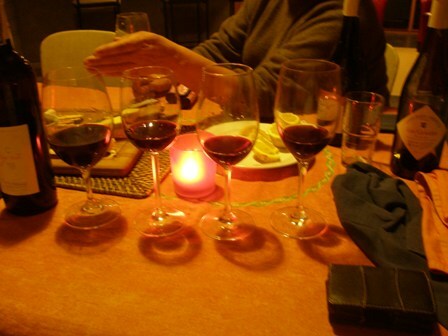 From left to right, we drank the Syrah by Domaine de Rapatel, 2008 and 2009 Big Betty Shiraz by the Mayer Vineyard and the 1996 Cornas by Thierry Allemand. Whereas the Domaine de Rapatel Syrah is “raisin” wine, made from very ripe fruit, heavy and full of fruit flavour, the Mayer wines try to be less of that style. Timo sees the Cornas as a benchmark for his own Shiraz wines. Both Big Betty Shiraz vintages follow the traditional wine making of Burgundy. 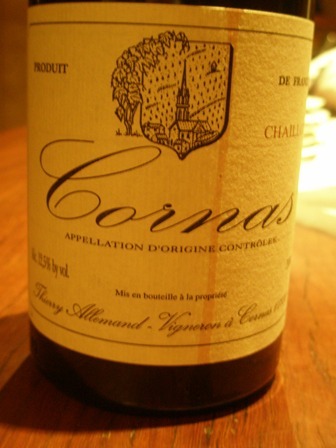 The Cornas has the “burnt rubber” taste, which is rejected by many wine lovers and seen by some as a fault (which is nonsense). It is also full of stalks and tannins on the palate resulting from the whole bunch fermented grapes. The range of different tastes, just from one grape variety, is amazing. 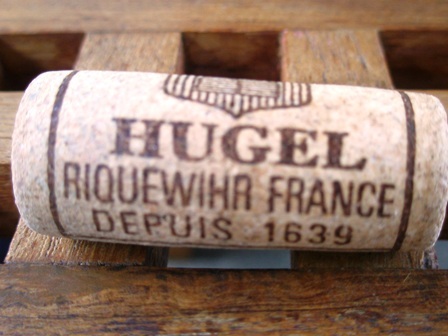 I ended loving the Thierry Allemand style wines best. The evening ended with coffee and water. We stayed over. It was just a wonderful evening, a great re-union and the sharing of experiences. We had to get up the next morning fairly early because Lucy and Charlotte were going horse riding. Getting up was not the slightest problem, we were still enchanted by the magical evening. Thanks folks. PS: The Bloody Hill Pinot Noir wines I have not mentioned above but will do so in a separate entry. The recent ABC Landline report nicely summarizes the predicament of the Australian winegrowers. A$ 250 per tonne for your fruit is just not covering costs. Grape growing has no future, it seems. I find it quite shocking somehow. The documentary depicts the individual detiny in a very touching way. Click on the link below and watch this very informative film. Sunday live music is one of the highlights in the Yarra Valley. 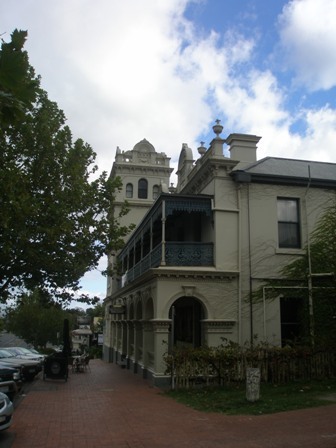 We used the opportunity twice listening to music at the Yarra Glen Hotel. 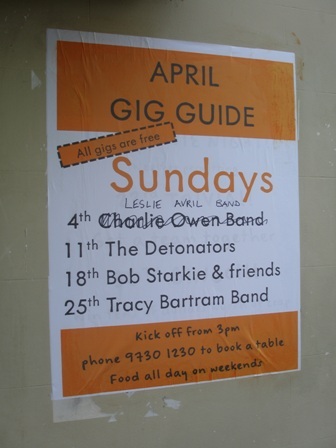 On April 11, it was the Detonators who entertained us. It’s something for young and old, and Sunday afternoon is just the right time. I just love it. 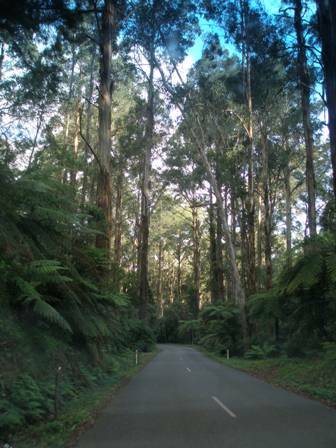 Needless to say that you can taste local wines from the Yarra Valley. 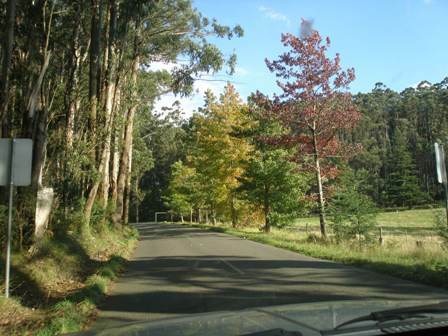 Autumn is a splendid time in Australia. It is the time of colours and, of course, harvest festivals. 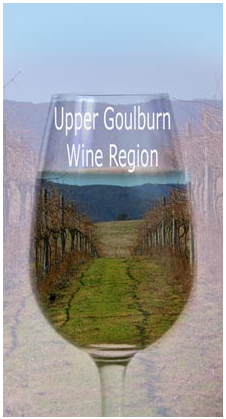 The past weekend saw two such events celebrating the 2010 vintage of the Upper Goulburn Winegrowers Association. The first was the traditional “Day on the High” in Mansfield, High Street, which is a street festival. 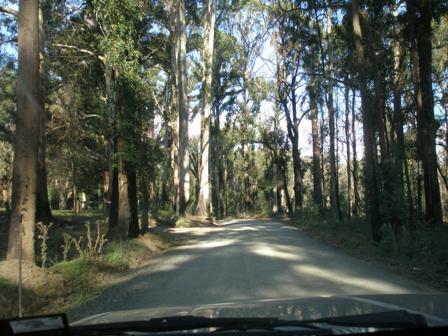 The second event was the “Upper Goulburn Long Lunch” which was held in the Mansfield showground pavilion. Both events are the highlight of the year for many of our winery members and the many related trades displaying their wares and produce, meeting friends, eating and drinking and being merry. Australia’s 2010 vintage was the smallest in a decade. Instead of 1.8 million tons of grapes, only about 1.4 million tons were harvested. The wine industry is being plagued by oversupply in general. Moreover, 2010 was another drought year with poor grape prices. Many grape growers just gave up. More than 8,000 ha of vines have been pulled already and many more vineyards have been abandoned. 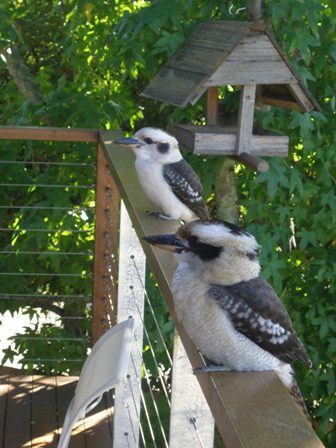 So therefore, this autumn was also a great time for the birds feasting on the many unharvested grapes on the vines. The wine industry crisis is hitting many family businesses, not so much the very small weekender and backyard vintners, but the full-time and medium-sized ones. Some of the investor driven schemes have also suffered. The corporates, however hard hit, are shedding “the fat”, meaning they are “selling the crap” and keeping the profitable brands and vineyards. For many vintners 2010 was not a good year and for many more, crunch time is still to come. But on this weekend those sombre thoughts were stashed away for a few hours. Let the good times roll on (even if only for a couple of hours). Finally, we had some rain on Saturday morning which might be an indication that a season’s change is in the making. 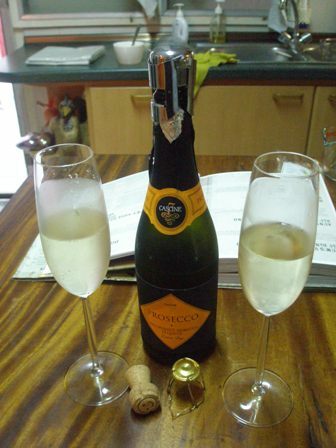 Anyway, it was cooler than normal which needed to be celebrated with a Prosecco. That’s how it started. In the background there was music from the Skyehooks, a Melbourne cult band from the 1970ies. All four of us we were very relaxed, did’nt have to be anywhere, did’nt have to go anywhere, in short quality time. 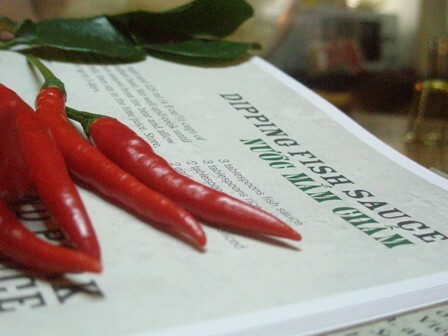 The cooking started with us making our first fish sauce. 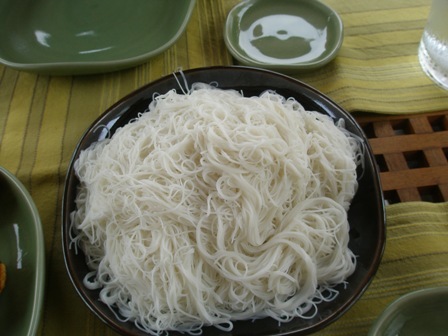 We followed Luke Nguyen’s recipe. I will not provie it here but instead encourage you to buy the book yourself. 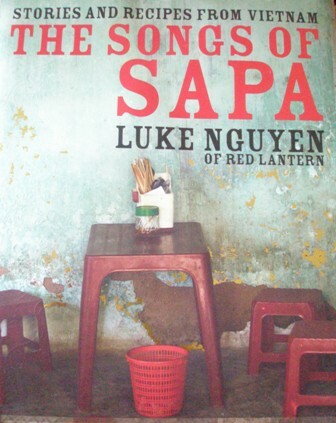 It is called: “The Songs of Sapa” and is the most fascinating cookery book I have seen in a long time. 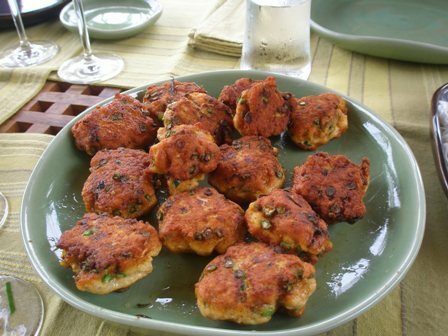 After that the fish cakes were made, also a recipe from the above book by Luke who has become a kind of celebrity chef in Sydney. Together with his sister Pauline and Mark Jensen he has his own restaurant called Red Lantern. 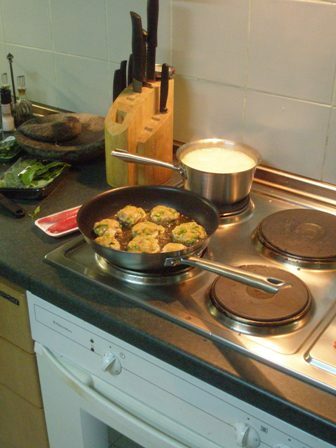 Fish cakes sizzling in the pan…..
You do not need cutlery or chop sticks, no, just use your hand. 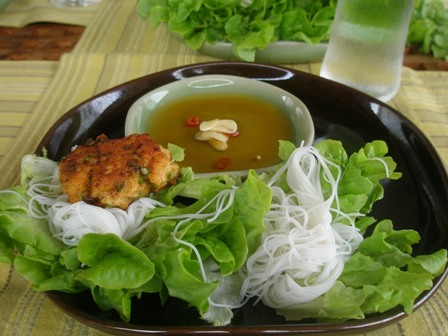 get some vermicelli on the salad leave, take some fish cake and dipp it in the fish sauce: hmm. You will not believe me but this is the most delicious “finger food”. 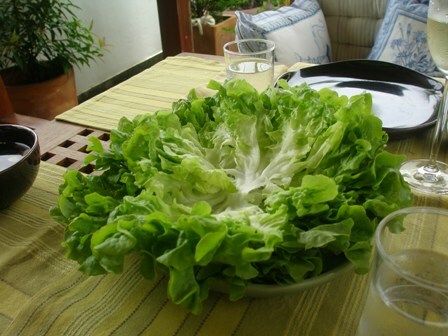 What we forgot in all our enthusiasm was the plate of mint leaves. We will try this next time. The last question: what about the wine? 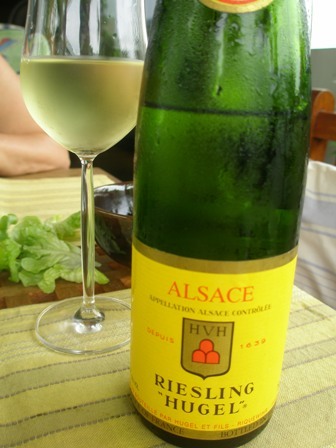 Well, I hose my favourite Riesling from Alsace, a simple ‘2007 Hugel Riesling’, a wine with zest and character, young and vibrant, a citrus bomb for the taste buds. If you have the chance to get your hands on Luke’s book, please do so. It is worth it. The recipes he has collected are wonderful. 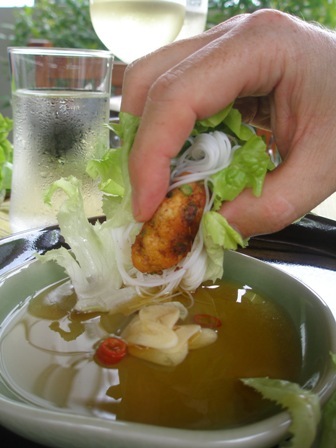 Vietnames cusine is light but at the same time filling. After this wonderful lunch we were not hungry until late in the evening. Lunch in the vineyard is always a highlight, especially if the weather allows us to have it on the terrace outside with those spectacular valley views. Of course wine is an important ingredient in a successful lunch. 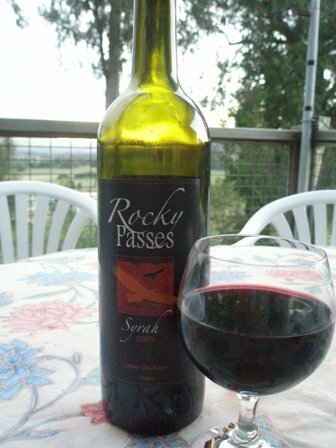 We had another bottle of Rocky Passes Syrah, the 2006 vintage this time. It received 92/100 Parker Points by James Halliday. Later the same day we followed the 2006 vintage with a 2005 Syrah. I had just one bottle of the 2005 vintage left which had received a whopping 94/100 Parker Points. Vitto Oles is doing a great job on these stony slopes of Rocky Passes Estate. 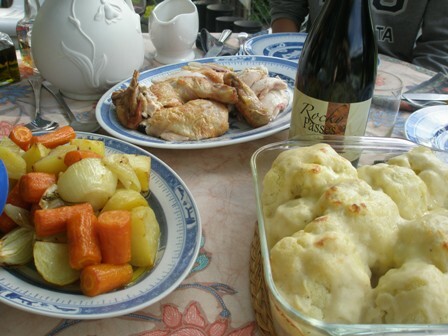 Good food and good wine, that’s what makes a great day. The other two ingredients are old friends and good music. Hope you have a good Saturday yourself. You are currently browsing the The Man from Mosel River blog archives for April, 2010.